It’s not exactly an outrageous claim, considering that the phone’s had a summer release date set since the beginning, and this lines up nicely with the previously speculated June 6th-13th launch time frame. Phandroid’s anonymous tipster was also kind enough to back it up with a picture of a supposed promo page for the Evo 4G in The Shack’s internal information system. No error level analysis needed this time around – anyone that’s spent a few months meandering through corporate training at a big box store can recognize an internal promo page when they see one. There have also been reports by users on the [Phandroid operated] Android Forums that Sprint is beginning to choose, or in some cases has chosen already, advocates for the Evo 4G in a few corporate stores. Apparently, about one month before launch, Sprint likes to pick one employee from each store to be an ‘advocate’ for an upcoming phone, allowing the employee early access to the device. 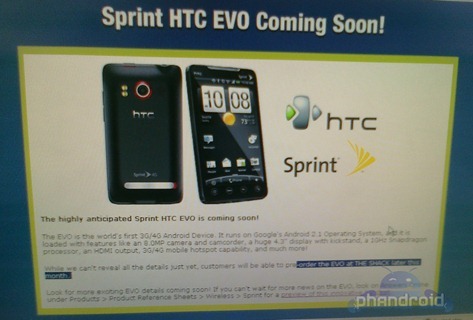 Should this be true, it reinforces the rumor that the Evo may be available next month. If any Sprint Evo 4G advocates are reading this, I know a certain Android blogger that would be very interested in speaking with you. We’ll keep our eye’s peeled for any further developments. In the meantime, check out the post at Phandroid and take a look at the quotes by the users over at Android Forums – remember that these are from forum users, so be sure to keep your skeptic cap on.